Last weekend I participated in Battle Apple, a modified version of Iron Chef that gave a group of college friends a great excuse to cook and spend time together. Of course, we made some modifications to the rules since it was completely unrealistic for all of us to be cooking simultaneously with no prior knowledge of the ingredients. In fact, cooking was the easy part. It was nailing down a date that worked for everyone that proved most challenging! We each brought one savory and one sweet dish (although after the sugar comas that ensued, we're reconsidering an all-savory battle for the next one). 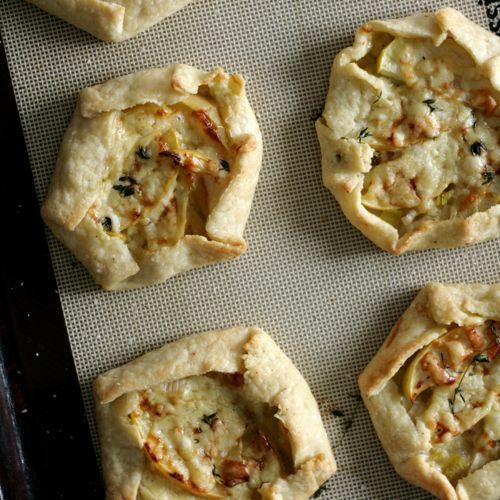 Here's how we played the game, as well as the recipe for my savory dish, Apple and Cheddar Tarts. 1. Not-so-secret ingredient. We didn't keep the ingredient a secret. At first we toyed with the idea of drawing for courses so we'd serve an entire meal, but it was decided that it would be hard to directly compare dessert to a side dish, so we settled on everyone making one savory and one sweet dish. 2. Keep it seasonal. Don't use asparagus in the winter or strawberries in the fall. Instead, choose something in season. 3. Plating. Each cook was in charge of bringing their own dishes to plate for presentation points. We wanted to avoid the host using up all the host's dishes (or running out). Plastic plates and silverware were passed around for tasting, and all the dishes were displayed nicely for all to see. 4. Recipes. You didn't have to create your own recipe from scratch, but if you used an existing recipe, you did have to change at least three elements of it (substituting an herb, or changing the cooking method, for instance) to make it more your own. 5. Cooking. Cooking was expected to be mostly done prior to arrival, if possible. The oven was available, if needed, but the limitations forced us to be more creative with the dishes as well. I ultimately chose items that could be served at room temperature. 5. Judging. The judging method was the same as the real Iron Chef competition. Points for plating, taste, use of secret ingredient. Apples are at their peak during the fall. I ve used Golden Delicious apples, but any variety will work here. Clean the leeks by cutting off the dark green tops, then slicing them lengthwise. Gently run them under cool water, removing any excess dirt with your fingers. Set on a kitchen towel to dry. Make the dough: Set a bowl of cubed butter and bowl of water in the freezer for ten minutes to ensure the ingredients are very cold. In a food processor, blend together flour, butter, and salt until the mixture resembles coarse meal (butter should be pea-size). Drizzle 3 tablespoons ice water evenly over mixture and pulse until incorporated. When it s ready, the dough should look very crumbly but hold together when squeezed between your fingers. If needed, add more water, 1 tablespoon at a time, pulsing until incorporated. Turn out dough onto a cutting board and gather it together with your hands. Gently form it into a ball, then flatten into a disc. Wrap in plastic wrap and refrigerate until firm, at least 1 hour. Do ahead: Dough can be made the day before and refrigerated overnight. Prepare the filling: Preheat the oven to 425 degrees. In a saut pan, add olive oil and warm over medium-low heat. Add the sliced leeks, leaves from one sprig of thyme; sprinkle some salt and pepper and stir to coat. Cook for three to five minutes, until leeks are soft and translucent. Set aside. Slice apples and drizzle with some lemon juice to prevent them from browning. Roll out the dough: Cut the dough in half, and then each half into thirds. Using your hands, roll each piece into a ball, then roll out on a lightly floured surface using a rolling pin. When the dough is about six inches in diameter, cut a circle using a large biscuit cutter or using a small bowl as a guide, cut around with a sharp knife. Set dough aside on a parchment lined baking sheet. Evenly distribute leeks in the center of each tart, leaving a inch edge. Place approximately 4 to 5 apple slices over the leeks, and top with about 1 tablespoon cheddar. Sprinkle the leaves from one thyme sprig over each of the six tarts. Crimp up the sides tightly and brush with an egg wash or melted butter. Bake for 20-25 minutes, or until crusts are golden brown. Serve warm or at room temperature.